It’s the little things in life that please me, and there have been a few things of late I have noticed or directed to which have left that warm fuzzy feeling. The latest is a nice little feature that appears to have been present for a very long time. Why I have not noticed (or paid attention) to it so far is beyond me. 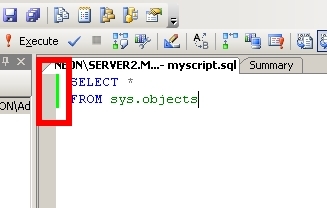 After writing a script in SSMS if you wish to reuse it, then it is probably a very good idea to save it now. However, before you do, have a look to the side of the script and you will notice a yellowish colour by the side of it. …Notice the colour that is now next to the script lines, it has turned a lovely shade of green. 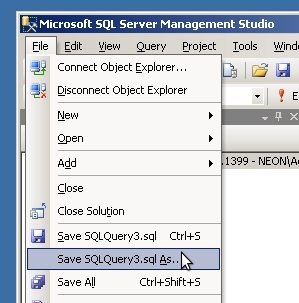 This appears to indicate that each line has been saved. What I really like is when various lines are subsequently changed. 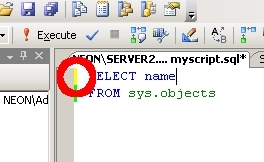 Any line that is edited reverts back to the non-green colour giving you instant feedback as to all edits that have been made and a good indication whether you want to commit these script changes to disk or not. 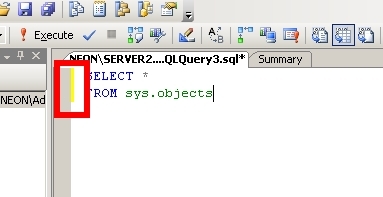 This entry was posted in Database, SQLServerPedia Syndication and tagged Color Highlighting, Desktop, SQL, SSMS, T-SQL. Bookmark the permalink.